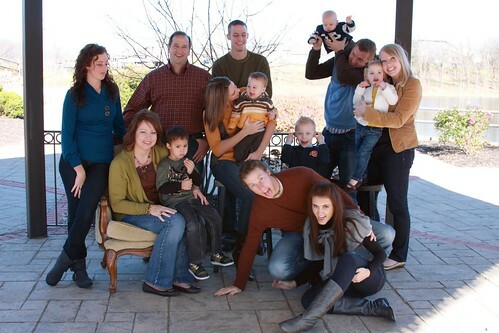 This picture is from Thanksgiving in 2009 and it is a funny version of a family picture (Kevin's side)! Do you love it? Hehe. This Thanksgiving we are in Kansas City! Last year we stayed in little Provo here. Today I must share some things I am thankful for. I think that so many people get bogged down on what they don't have or something little that is bothering them that they don't realize how good they have it and all of the things they are blessed with! I need to always remember to be more grateful! If you blogged about it, leave me your link in a comment; I'd love to read them! Also, if you want you can create a DIY Thankful Board...go here! And...who all is going Black Friday shopping? Are you planning on getting something good? today i'm really thankful for cups of hot chocolate in these rainy days (it's already raining season here in indonesia),i'm thankful for a peaceful afternoon at home and dvd!!!! p.s :watch out, looks like kevin's gonna eat u in the picture.haha. Great list! I blogged mine too. I love this holiday because it is important to remember to be grateful! Did you do your mission yet, and if so, where?